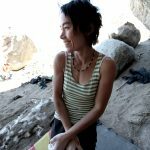 For over a decade, my life has been weaving in and out of a nomadic lifestyle whose main purpose was to follow a blue colored sky and a shining sun overlooking a field of boulders. Living such a life entwined with climbing has given me many invaluable experiences not only about the sport but also life lessons about myself and the world. I often wondered how I could say thank you to a sport and way of living that has given me so much. So far, this is what I have come up with. I hope people find this useful. V10. What is that? It is a number signifying the level of difficulty of a boulder problem but it is also more than that. It's a breaking point. A level perhaps not yet reached but knowingly, attainable. But how can one reach this exactly? What skills and mindsets are needed that will enable people to reach their next level be in v5, v10 or v13? Below are some tips which I have gathered which have helped me and others push through plateaus and reach the next level. Try many problems, easy and hard, regardless of the grade, regardless of the style. This way you get exposure and experience on many different holds and styles that will help you breakthrough to the next level. It helps to travel to places so you can widen your base and abilities even more. If you can’t travel then be sure to try those obscure problems and lines that perhaps have overgrown or that you promised you will ‘one day’ try. If you are stuck in the gym, make up problems that are your anti style or that play on your weaknesses. The only way to climb v10 is to try v10. So be sure to try a lot of them but avoid limiting yourself to trying JUST v10’s. The world is your oyster and every problem can teach you something. Climb with different people. 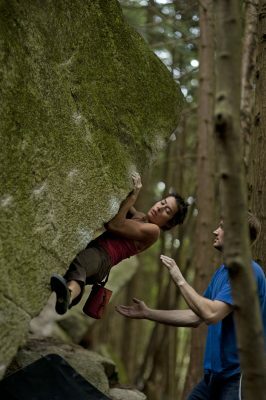 Everyone has different climbing styles, abilities and something to offer. Climb with people who inspire and can teach. Be open to healthy criticism; be willing to learn and to hear what you may not want. If what you have been doing isn’t working, change something. Step out of the normal routine; go to different problems, areas, gyms. Hell, even try a different mode of climbing like clipping bolts! Self-limiting thoughts get you nowhere. As does not trying something because it is ‘too hard’. If a line entices you whether it is v0 or v13, then try it. You have the power to make or break your own limitations but the limitations that others put on you be it friend or foe is none of your business. Try to not let the negative influences of others bother you. Too often people limit themselves to the problems that suit only their strengths. Avoid doing this by working your weaknesses and widen your base by opening up your world to the world of slabs, slopers, pinches, crimps, roofs, etc. Eventually, improvement will come so just be patient. Often people ask the grade of a problem before trying it which can be limiting. When the answer comes around, some won’t try because they think it is too hard but there are also the folks who won’t try because they think it is “too easy”. Try everything! Ask your friends what they think your weaknesses and strengths are. Work to improve your weaknesses and take advantage of your strengths when seeking out a problem which you want to try. Visualize yourself sending your project. Imagine how the holds feel to your fingers, how much weight to put on each foot, how to move your body. Invoke the feelings of trying hard and how much effort you need to release with each move. Go over the sequence again and again not just with your mind but with your body. Breathe in the feeling of satisfaction when you pull through to the finish. Imagine and believe. Amazon shopper? Buy this great book by Dave MacLeod and support my blog! Try really hard not because you have to, but because you WANT to. Want it like a passion that burns through you that won’t be satisfied until you do it but remember that when it is done you still won’t be satisfied. Try so hard that you aren’t scared if your tips bleed. Give 101% on your send effort. Grunt. If all else fails, try harder. Avoid excuses about the conditions and your performance. They contribute to weakness and are limiting. You can’t change the external state of things so just deal with the internal and work with what you have. And most of all; be determined. Be a fighter. Stick with it and remember why you’re doing it. The journey is the reward not the destination. Be prepared to fail. It comes with the territory. When you fall, get up, try again. Find out why you fell. Ask others more experienced for advice. Be open to learn. Avoid not trying a problem because you are afraid that you may fail on it. You will never know till you tried and it is better to tried and failed then to not have tried at all. If your emotions start to take over, walk away but remember to walk back. Being close to sending a project can build hope which is good but can also lead to expectations and pressures to send. Before approaching the problem, instead of thinking about topping it out and finishing, try to focus on each movement and the climbing itself. As Bruce Lee would say: “Be like water”. It can help to find a problem that is your style be it crimpy, slopers, slab, big moves, tick tacks, steep, whatever. Often enough I have to hunt around because harder problems tend to have bigger moves and with my small stature this can be an issue. That said, not trying something because it has a kind of move that you may not be good at is very limiting so try it anyway. 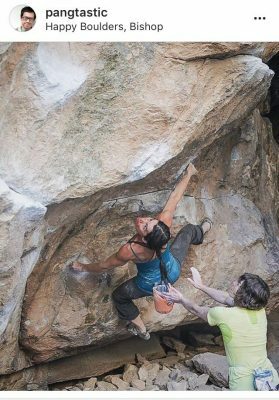 If anything, it forces you to work your weaknesses.Some folks like to go for ‘soft v10s’ such as ten-ten in hueco, but aiming for a solid v10 such as ‘Power of Silence’ or ‘Thriller’ will be much more satisfying... Trust me. If you want to get better on rock, climb rock; just like, if you want to improve on plastic, climb plastic. Train what you want to improve. A golden rule is climbing trumps training. Understanding movement is very important. I have seen plenty of strong climbers struggle on problems that ‘should’ be relatively easy considering their strength simply because they didn’t understand movement. Train your weaknesses. If you need stronger fingers, hit up the hang board for a bit but also mix it up with climbing many problems needing strong fingers. Need more power? Train power but also get on problems with powerful moves. If there is a certain type of hold or movement on your project that is shutting you down, build a mimic in the gym that will work on specifically this. If needed, get a coach or trainer that will help with technique, climbing specific strength, movement etc. Avoid overtraining! Rest, relax and listen to your body. Injuries delay progress! Despite the burning desire to return day in and day out to your project, give it a break. The body will appreciate the rest as will the mind. Often my desire puts a blindfold over the memory of this lesson I had previously learnt. Recently, I spent the last 8 climbing days returning to my project. Falling off the end half of those days kept me motivated yet the other days offered digression. 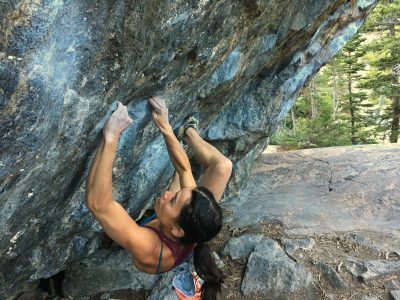 My mental focus was diminishing and my body was building an overuse injury from repeating the same crux move over and over again. Did I send? No. Lesson? Take a rest from your project. The chance of actually sending will increase tenfold and instead of offering a ‘bitter, thank god the ‘torture’ is finally’ over type of send, it will feel much more like a ‘happy, satisfying, enjoyed’ type of send. For a long time I never considered myself an athletic and scoffed at those who did things like dieting, cross training and weight lifting. But as I progressed and wanted to improve I realized other things had to be considered. Balanced training, cross training and eating healthy would all come second nature to any serious athletic but many climbers seemed an exception to this rule. So find out how other athletics train and learn from them. Eat smart. Eat healthy. Not only will it help you recover faster but your body will be happier, lighter and performance will improve. Stretch on rest days; cross training for balance, remember your core, stay on your toes and always listen to your body. If you've found this post helpful, feel free to make a donation to help sustain this blog and life! Thank you, for this most recent post. I am, every time, uplifted and inspired by what you write. Thank you – this is really inspiring.